Mile 0 of the C&O Canal Towpath in Georgetown. We ate our last trail meal by a dragonish sculpture on the steps of a big sundial just outside the Swedish embassy near the Mile 0 marker. The final day started with the hotel shuttle back to the tiny ferry to get on the trail. While the sun was shining in a clear blue sky, the air felt much cooler than we’d thought looking out the window and within minutes of starting to ride we stopped to put on more layers. Boy, do we love merino wool. Today was another great day for wildlife. 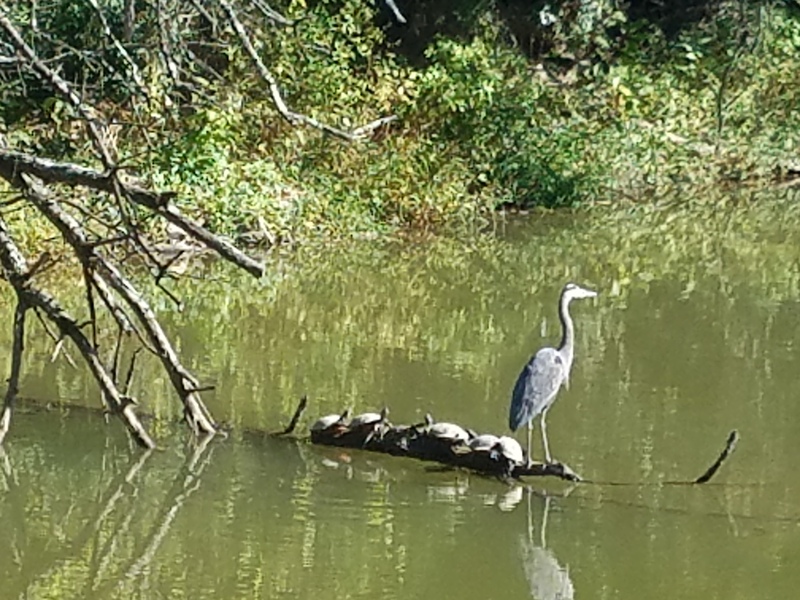 We saw several logs absolutely full of basking turtles, six or more great blue herons, and within three miles of Georgetown a deer browsing right next to the trail who just looked at us and didn’t bother to move away as we cautiously crept past in an effort not to spook her. One of the herons flew up from the path just a few feet from Eric, who exclaimed as the bird spread its huge, dark wings and veered away. 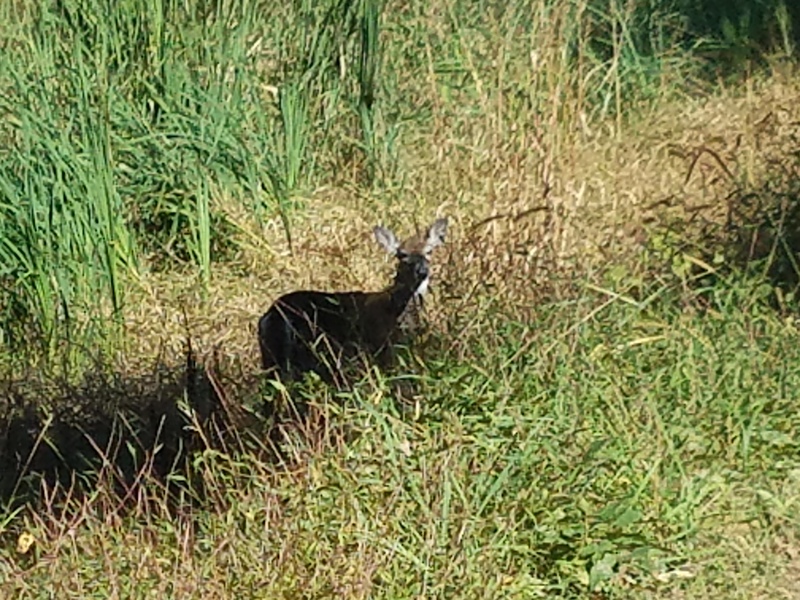 Cars zoom past on a big multilane road just above the C&O Canal Towpath where this deer browsed calmly. We rolled through about four miles of artists, too. Yes, artists–people set up with easels capturing a beautiful stretch of the Potomac. Throughout the journey we could generally tell when we were approaching a town because we’d start seeing more traffic on the trail, especially more walkers. By “traffic” I mean maybe half a dozen people over 2-3 miles but that was still lots more than we’d see for miles and miles of just the two of us. The Great Allegheny Passage and C&O Canal Towpath both have mile markers. Some days I used these to guesstimate how much farther to the next stop but that was usually just an approximation. This last day, however, those numbers counted down to an exact destination so they carried more meaning. The very end in Georgetown was confused a bit by construction. It felt a lot like finding your way through the Seattle waterfront tangle along Alaskan Way, complete with an overhead viaduct. But we made it at last and took our picture with the granite marker. 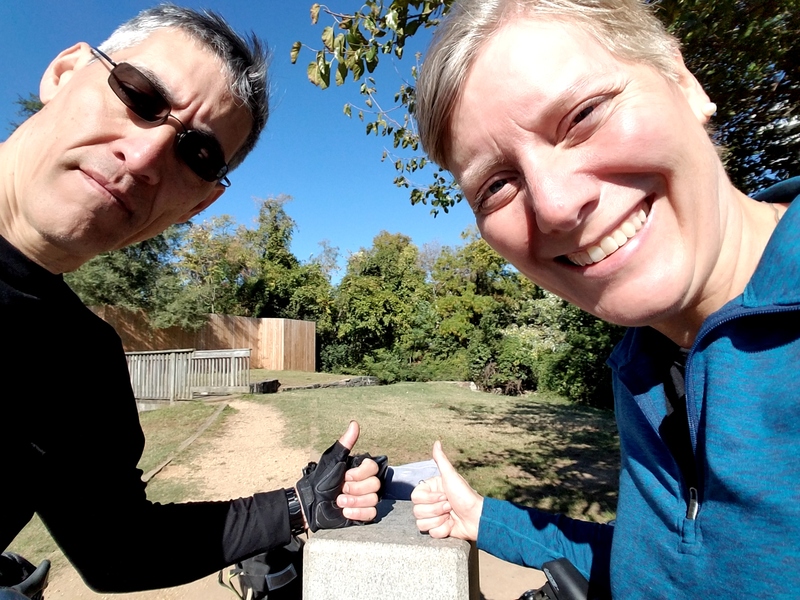 Then we made our way to my brother’s house using the great Arlington Loop trail system, although not without a few glitches thanks to Google Maps trying more than once to switch to the shorter but less pleasant street option. Beware accidentally selecting a different suggested route when you think you’re just confirming that you’re still on the one you want. My Ride with GPS map has some squiggles and U-turns that make no sense unless you add a soundtrack with me exclaiming, “What the–? !” repeatedly. 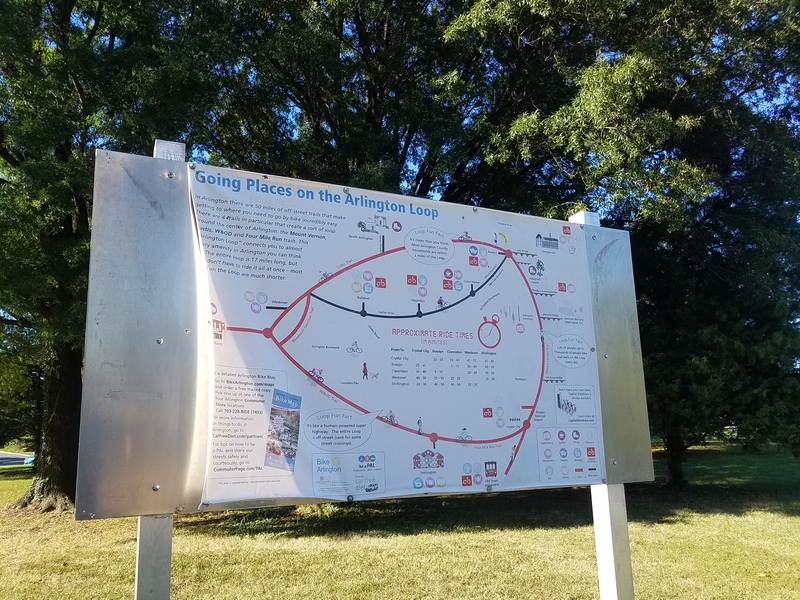 The Arlington Loop provides a tremendous connection. 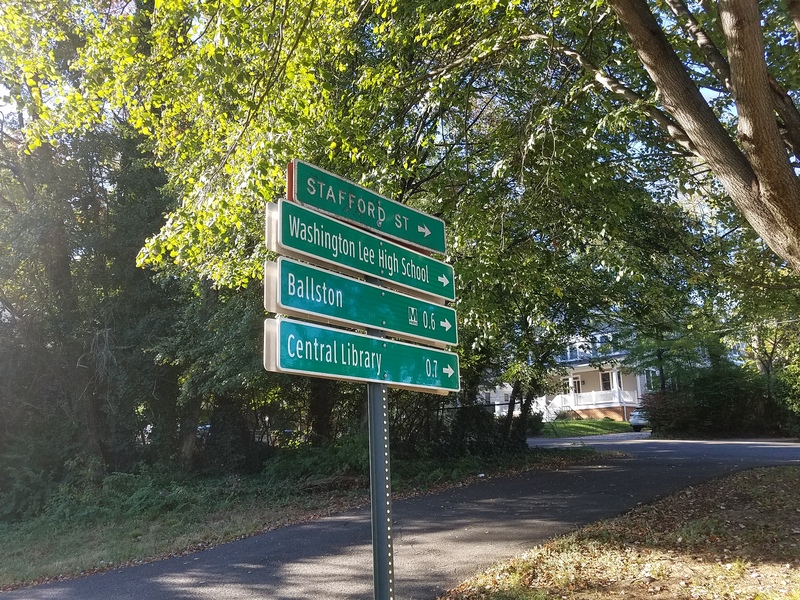 Wayfinding signage appears at intersections along the Arlington Loop. And look–they tell you which street the trail is crossing! Not a common practice but one that’s essential to a real bike transportation network. If I had trusted the signage more and Google Maps less it would have made for smoother navigation while we were on the trails but I kept worrying we’d miss a turn where we had to get to a street. This trip has been a more complete getaway than any vacation I’ve ever taken. After 10 years of marriage this is the longest “real vacation” Eric and I have ever taken. We’ve made shorter trips or had a staycation, but not something like this that removes us from chores and habits for days on end. A self-supported itinerary meant not being tied to any schedule other than getting to the end point each day. Having the itinerary and all the overnight stays planned for us made advance prep and the actual experience so simple. Thanks, Sara and Bike the GAP! Being pretty constantly in motion under my own power meant not having the distractions of my electronic devices constantly beckoning, other than stopping to take pictures of turtles and signage and scenery. The isolation of the trail created time to let my mind play, while at the same time the need to pay attention to the trail surface also kept me from thinking about work or anything requiring deep concentration. We spent the majority of each day far from human-made noise pollution other than our tires. No car engines or honking horns, almost no airplanes, no crowds. 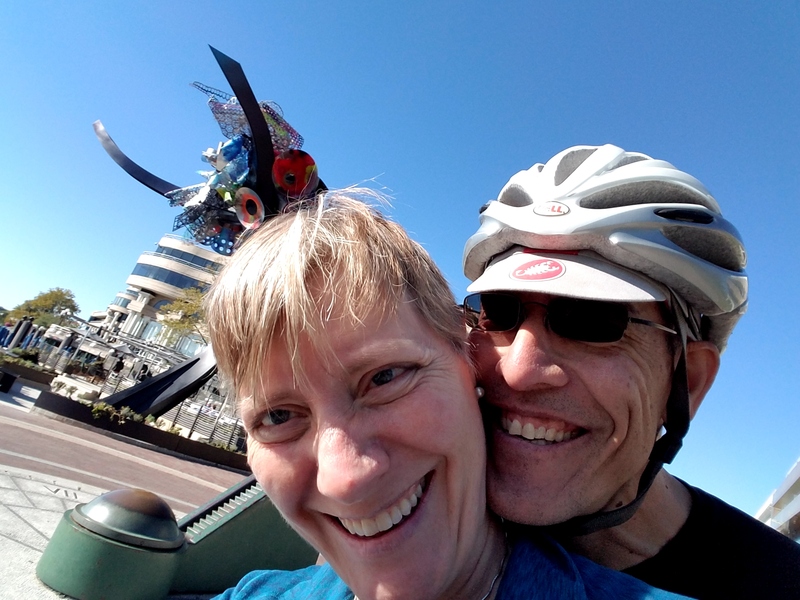 I generally love (walkable bikeable) towns–and the coffee shops to be found in them–but this much time in nature provided a real respite for the nerves. Now we start planning for next year–and for some shorter weekend trips in Washington state to the best of our trails. Loved the story Barb! Thanks again for all the advocacy you do for all riders! Thanks for reading! I so appreciate all the advocacy others did to create these trails. Look how it paid off for these regions.